Col Latifa Nabizada, the first female pilot in the Afghan air force, has battled prejudice, the Taliban and personal tragedy - but her ambitions for her young daughter soar even higher. My sister and I always talked about the stars and the universe. We talked about how aeroplanes were made and what it would be like to fly one - how it would feel to be a pilot. There were water butts near where we lived and I used to climb on top and imagine I was flying a helicopter. After we had finished school, Laliuma and I told our parents we wanted to be professional pilots. They were quite shocked. 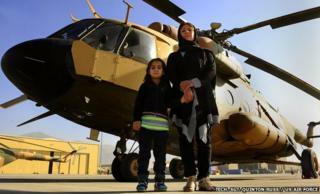 At the time, not many women in Afghanistan could work and there we were, thinking of becoming pilots. But we managed to convince them. My father's support was huge and it helped us a lot. Latifa and Laliuma were repeatedly denied admission to the Afghan military school on medical grounds, but they eventually joined in 1989 after being certified fit by a civilian doctor. No women's uniforms existed, so they made their own. We were the first two women pilots in Afghan air force history. The other students threw stones at us. We used to leave the classroom in protest - then our teachers would come out and apologise and we would go back in. We were all so young and such things happened at that time. Considering the social conditions, people were quite positive about it. We worked really hard and our exam results were quite good. Of course, our male classmates weren't that happy and felt a bit jealous. But we didn't pay much attention to them. It was because of our sheer interest in the subject, and also with the blessing of God that we had potential and talent. My first independent flight was an unforgettable experience. It was in the northern city of Mazar-e Sharif, and the flight was part of my examination. I flew - I flew and it felt really great. And I thought: "This is what you get after all that hard work." At the time my teachers kept saying: "Please pay attention! Look down at all those government officials, look at all those flowers in their hand! They are just waiting for you to come down and they will greet you." That was a tremendous feeling - but I really had to pay attention to the landing. We have two kinds of landing and the horizontal one takes a lot of accurate calculation. After becoming pilots, Laliuma and I were treated differently from the male graduates. There was war at that time - some provinces were secure and some provinces had conflict and insurgency. At first, we were told to only fly in the secure provinces. In 1996, the Taliban secured Kabul and Latifa and Laliuma moved to Mazar-e Sharif. General Dostum was commander at the time in northern Afghanistan and he helped us a lot, giving us a secure place to live. He wanted the news to go out all over the world that he was a supporter of women's rights. During his time we flew missions - we fought the Taliban. But before long, the women were forced to flee to Pakistan, where they wove carpets for several years, keeping a low profile and fearing for their lives. Eventually they were able to return to Kabul. When people said the Taliban were on the way out and there would be another era for Afghanistan - women would work again, and be allowed to go out, and be able to do whatever they wanted - pleasant as that idea was, it was also unbelievable. Brig Gen Khatool Mohammadzai was the army's first female paratrooper and has made more than 600 jumps since 1984. She stayed at home sewing during the days of the Taliban regime... and ran a clandestine school for girls. She has been awarded paratrooper medals by the United States, Canada and France. But according to an article in Newsweek, she has lately been sidelined by the male-dominated defence ministry. I got to Kabul at night, but I just couldn't wait. I went to the military base and said "I'm back and I want to start working again". They told me that there would be a celebration in Kabul in a couple of days' time and my first flight would be during that celebration. And it was beautiful. Latifa and Laliuma were both married, and in 2006 they became pregnant within weeks of one another. They kept the news quiet from their commanding officers for as long as possible. There was a need for us to fly and we flew a lot of missions during our pregnancies. Despite that, I managed to bring Malalai into the world well enough. But my sister had a difficulty in her childbirth. The doctor at the time said she had a choice: "Do you want us to save your baby or yourself?" And she was in love with her baby and she said "Save the baby, whichever way you can." The next day at 16:00 she lost her life. All our life we had been together, played together, flown together. She was my strength and I was hers. And we had been through difficult missions and to the frontline, we had transferred dead bodies and the injured. So many officials in the Air Force of Afghanistan told us: "We will never see the likes of you two again." She was an incredibly courageous woman. I cannot tell you how it feels every day without her, bringing up her child. Latifa breast-fed her niece Mariam as well as her own daughter, with her mother helping with childcare. She went back to work within months of giving birth. Unfortunately, there was nobody to take care of my daughter at home and there is no kindergarten in the military. So most of the time I took Malalai with me in the helicopter. She has grown up in a helicopter - sometimes I think she's not my daughter, but the helicopter's daughter! She was almost two months' old when we first flew together. Five year-old Malalai is named after a Joan of Arc-like figure who rallied Afghan forces to defeat the British at the 1880 Battle of Maiwand. She also spoke to Outlook. Malalai, do you enjoy flying in a helicopter? Yes. I feel as if I am hugging the stars. Do you ever get frightened in the helicopter? Do you ever want to push any of the buttons or hold the controls yourself? No - what if something goes wrong? The helicopter will crash, God forbid! I want to become a pilot like my mother. She would fall into a deep sleep and wasn't any problem. As she grew up, she'd stand next to me and whenever she felt sleepy she would lay her head on my shoulder and fall asleep. When our American advisers saw this they would say, "Don't keep her here, she'll be in danger - put her in the cabin." But Malalai used to cling onto my clothes and say, "Mum, I don't want to go there, I don't want to go there!" I would assure my American colleagues that if she stayed with me I would fly safely. We were very cautious - we only went together on the routes that we knew were secure. Nowadays, my daughter goes to school during the day, but I have asked the military to make a kindergarten for the other girls that are coming off courses and starting their jobs here. Customarily, when you ask a kid whose child they are they give their father's name, but Malalai always says "I am the daughter of Pilot Latifa". She is immensely proud - and so am I.
I think her journey will be much easier than the one Laliuma and I had. I'm so thankful to my father, for all the support that he gave us. Now, being a mother myself I'm aware of the difficulties a parent faces raising a child, making sure that he or she achieves all the goals that he or she desires. She is very interested in space. My ambition is for her to go to space - to become the first astronaut for Afghanistan. I hope my country will provide such opportunities by the time Malalai has grown up. Outlook is broadcast on BBC World Service. Listen to the episode featuring Latifa Nabizada's interview via iPlayer or get the Outlook podcast.